Buffalo County Community Partners brings community members and resources together to promote good health, well-being, and happiness in Buffalo County, Nebraska. Strategic Planning: Qualified staff available to work with coalitions or partnerships to clarify overall purpose and desired results. Effective Social Media: Qualified staff and coalitions available to develop media plans incorporating Facebook, Twitter, Instagram, web sites and more. Technical Assistance for Non-Profits: Qualified staff and volunteers available to discuss policies and procedures with other non-profits or groups looking at starting non-profits. Policy Development: Qualified staff and coalitions to plan a course of action intended in influence and determine decisions, action and other matters. Advocacy: Active adults and youth working within coalitions to support a cause or course of action. Data/Research: Research assistance to determine best approach to problem solving and evidence based strategies. Focus Group Planning: Bring residents together to better understand issues of concern, honor work and understand resources. Coalition Development: Mobilizing residents to elevate community issues, engage the community, empower people, and evaluate progress toward goals. Community Facilitation: Qualified Staff and volunteers to simplify planning processes. QPR (Question, Persuade, Refer): You can help prevent suicide. Learn how with QPR. 40 Developmental Assets: Learn to use the developmental assets approach to building strong communities and resilient people. Bullying Prevention Resources: Learn how to handle bullying, now, and prevent it in the future. Second Step: Learn about the Pre-K through middle school curriculum that helps promote social/emotional skill that lead to academic and social success. Worksite Wellness: We are currently designing a worksite wellness program for Buffalo County. To help us meet your needs, please take our short survey. Safe Routes to School: Utilizing federal grant funding, we’re working to develop programs, initiatives, and activities to increase the number students who actively commute to school. We’re doing this by building advocacy and collaboration among school administration, staff, parents, and community members. Be Active! Campaign: We promote active living with tips, resources, and information on good habits and great places and events to be active in Buffalo County. Unplug! Campaign: Focused on reducing screen time and increasing physical activity, this campaign features resources for youth at school and at home, as well as adults in the workplace. ReThink Your Drink! Campaign: We provide resources and information, including an interactive display/presentation, on choosing water over sugary beverages. Lighten Up! Campaign: Tips for healthy eating habits, healthful recipes, and information on the USDA’s MyPlate guidelines are just part of this healthy eating campaign. Community Health Worker Education: Educating stakeholders about the growing workforce of Community Health Workers that have made considerable efforts to reduce health disparities among underserved populations, increase access to health care, and help reduce medical costs to the public and private sector. Behavioral Health Integration: We are working to bring behavioral health resources to physicians to bridge the gap between physical and mental health. Diabetes Referral Network: Developing a diabetes referral network for diabetes self-management and diabetes prevention programs for providers located in Buffalo County. Parents, Take a Stand – Parent Resources: We offer resources and tips for talking to your children about substance abuse. It’s never too late to start the conversation. Prescription Drug Take-Back: We assist the Buffalo County Sherriff’s Office with biannual collections of unwanted, unused, and expired medication. Responsible Beverage Server Training: We offer Training for Intervention ProcedureS (TIPS) a skills-based training program that is designed to prevent intoxication, underage drinking, and drunk driving. This course is offered to retailers, universities, and special event workers/volunteers. Be Safe, Be Smart Task Force: Task force created to elevate issues around drinking behaviors over Cruise Nite weekend. The task force emphasizes awareness, development of policy, and the overall goal of changing the social norm linked to Cruise Nite. Physician Resources: We offer a local listing of Alzheimer’s/dementia resources for physicians to share with patients and patients’ family members. To view the resource directory, visit our Alzheimer’s/dementia page. Mentoring: Mentors make a real difference. Community Partners promotes youth mentoring in Buffalo County schools. Second Step: Community Partners provide Second Step curriculum kits to schools and community based child care organizations in Buffalo County. Trauma-Informed Care Training: Community Partners helps to promote this people-centered approach to helping individuals reach their full potential. PhotoVoice: Helps area young people connect to their community through the medium of photography. 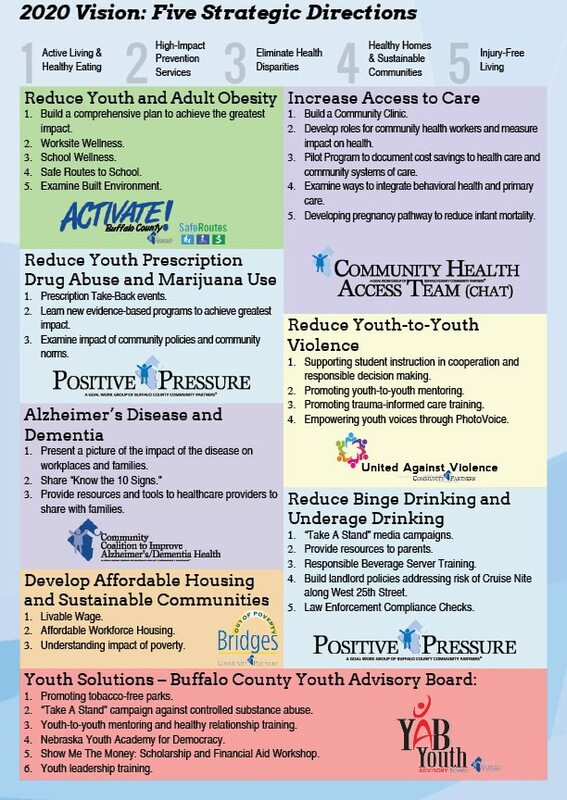 Empowers young people who want to have a positive impact on the health and quality of life for the people of Buffalo County.